The parallel parking or reverse parking as it can also be referred to is one of four manoeuvres you will need to learn before taking the practical driving test. The reverse parallel park manoeuvre is one that many struggle with due to the complexity of the manoeuvre. Reverse parking is made easier by the use of reference points which is what we will use. The parallel parking reference points tutorial offers a guide from inside the car.This tutorial will offer an ideal technique and guide with diagrams that should enable you to pass this part of the driving test. A good driving school or instructor should provide you with complete instructions, ideal formula and plenty of reference points to make the reverse parallel park easier for you to complete successfully. To successfully park behind another vehicle and by finishing not too far away from the vehicle in front and not too far from the kerb. Also by not touching the kerb or mounting the pavement. By keeping the cars speed under control by use of clutch control and by use of effective steering. Constant all-round observation throughout the manoeuvre. Prepare – to prepare the car. For example, get the correct gears, handbrake etc. The POM routine should be carried out in this order each time the car requires a change of direction from forward to reverse. If for example you forget to prepare a part of of the car after you have completed observations, you will need to carry out observations once again after preparing. 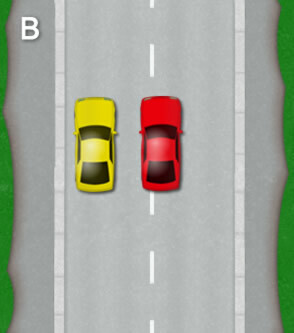 During the driving test, the examiner will ask you to park on the left. This may simply be to test your ability at parking on the left safely, or it may be for the reverse parallel parking manoeuvre. 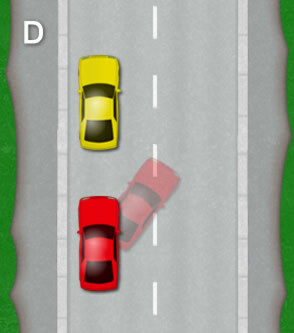 The examiner will provide a briefing that they wish you to demonstrate the reverse parallel park on the car in front, which in diagram A is the yellow car. Whilst moving off to get position for this manoeuvre, move off slowly so as to get an ideal and accurate position. The examiner allows plenty of time for manoeuvres, so no need to rush. 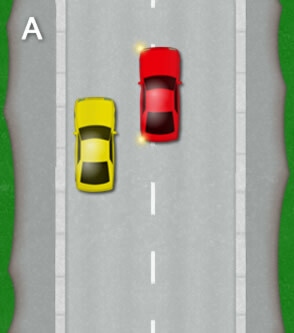 As you are about to pull alongside the yellow car, check your interior and left mirror. If there are approaching vehicles, cyclists or pedestrians, indicate to the left. Ideally, stop a little ahead of the yellow car (around half a car length) and for the distance away from the side of the yellow car, around half of a metre up to 1 metre maximum. Once stopped, remember to cancel your indicator if you applied it. Now select reverse gear regardless of any approaching traffic as your reverse light will provide them with your intention to reverse. Before you start reversing backwards, it is essential you take all round effective observations. If there are any approaching vehicles or cyclists, wait till they have passed. Also remember pedestrians. If they are close or approaching your car at any point throughout this manoeuvre, stop and let them pass. Once you are happy it is all clear, look in the direction that the car is travelling, which is out of the rear window, then proceed to move the car backwards. Keep the car very slow. Think of a slow walking pace to give you an idea. Good clutch control is required to keep the car this slow. If your car permits, just use the clutch to move the car and cover the brake in case you need to stop quickly. Not all cars allow this feature however. You will now need to get the rear of the cars level. Set yourself some reference points to help. For example, if the cars are facing the same direction and are a similar size, line the side mirrors up. Another reference point that may work is to line the rear of the yellow car into the centre left rear window of your car. It is better to go a little too far back than not enough. Not going far enough back may result in your car turning into the car you intend on parking behind if you are not careful. Establishing and getting confident with your reference points is important and certainly will help with this manoeuvre. Keep the car very slow as you will need to constantly look around in all directions and be accurate with your reference points. Once you are happy the cars are level, stop the car. Your car is now at it’s point-of-turn. It is likely just for information purposes, that the examiner will ask you to reverse parallel park behind a single car and not in between 2 cars. In a moment, whilst reversing you will be steering to the left. This is called the point-of-turn and the front of your car will swing out into the road. This is the most hazardous part of the manoeuvre. Before moving the car or steering, take all round effective observation. This includes your right blind spot in case there maybe cyclists you can’t see in the mirrors for example. If you are happy it is all clear, look in the direction the car is travelling (out the rear windscreen) and very slowly move the car backwards. 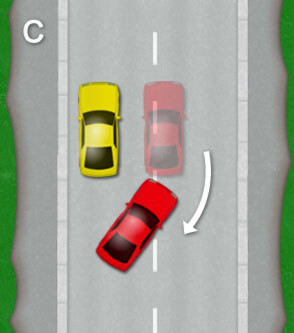 Just as you move the car, steer 1 complete turn (360 degrees) to the left. By turning the wheel 1 turn to the left instead of left lock, it will make the turning angle slightly shallower at around 45 degrees. This will eliminate the possibility of your car turning into the car you are parking behind. You will now need to establish the next reference point. This is the point in which you steer to the right to straighten the car. Whilst reversing to this reference point, you will need constant all-round observation and likely needing to stop if any vehicles approach at this point. Also if you are reversing towards pedestrians, stop, allow them to pass before proceeding. Don’t forget to make frequent checks out the rear windscreen. This reference point can vary from car to car, but to give an idea of what usually works is to line the left corner of your car up with the right corner of the car you are parking behind. At this point, steer full right lock. Another example may be to use your left mirror and when the kerb in the mirror gets to a certain point (usually about to disappear from view), that’s the time to right lock the steering. Whichever reference point you use, or your instructor demonstrates, once you reach it, stop. By stopping at each reference point, it breaks down the manoeuvre, allowing you to look around more and slowing it down. It may be an idea to choose a reference point that may ultimately leave too much of a gap from the kerb to eliminate hitting it. Don’t be fooled into thinking the reverse parallel park has to be completed in one single perfect move. It’s better to adjust than hit the kerb as this may result in a test failure. if your car is parallel from the kerb and a suitable distance from the kerb (around 30cm) to stop. If you feel the car is a suitable distance from the kerb and do not need to adjust, just before you stop, steer your wheel to the left 1 turn to straighten up the front wheels. If you are too far from the kerb, then essentially you will need to repeat the point-of-turn procedure as in diagram C. This time however, as you start to move backwards you can left lock the steering wheel as the car in front is not a hazard. For this second point-of-turn, you may need to establish a different reference point. One that often works, is as you are reversing on full left lock, in your left mirror, there is a triangle formed between the kerb you can see in the mirror and the side of the car in the mirror. Keep reversing until the triangle has disappeared. Once it has, right lock to straighten the car. As the kerb and your car look parallel in the left mirror, steer 1 turn to the left to straighten the front wheels. Once stopped, apply the handbrake and select neutral. There are potentially many reference points to remember in this manoeuvre. With a lot of practice you will remember them all and it will become easy. Upon finishing parallel parking, if you there is a gap of a cars length or more between you and the target car that you parked behind, pull forward to decrease this gap. Ensure however that you leave sufficient room from the car in front so that you can move off (when the examiner says) without the need to reverse again. Some roads can have steep cambers as shown in the diagram. During the reverse parallel park, as you are nearing the Kerb, this is the danger area for rolling the car. Try and keep your brake covered here to stop if need be. See road camber for a more detailed explanation of road cambers. Also when moving off when the manoeuvre is complete, if your wheels are still turned to the right, you may find that the front of your car will swing round to the left and hit the Kerb. Try and be aware of cambers and if necessary, use the clutch bite point to eliminate rolling. Reverse Parallel Park Help and Tips! Below are help and tips to enable you the best chance of the reverse parallel park manoeuvre during the driving test. UNDER PRESSURE: Ideally, the examiner will pick a quiet road to perform the reverse parallel park on. Unfortunately this isn’t always the case. If the road isn’t wide enough, you may find vehicles start to wait. Some of them may even become impatient. The examiner allows you plenty of time to demonstrate a manoeuvre (around 4 minutes). Don’t rush to reverse parallel park if you get stressed. The likely hood of something going wrong is massively increased. PERSEVERE: Don’t forget that at this point you are still a learner and not a professional driver. The examiner isn’t expecting you to drive like a professional. If you do for instance, over-shoot a reference point, explain to the examiner you need to pull forward to correct yourself. There may be a chance you could get a minor for correcting yourself but it is much better than ultimately hitting the kerb or even mounting the pavement which will result in a fail.However, a gentle nudge or scrape on the kerb should be fine. If however you knock it abruptly or mount the pavement, this is likely to be a certain fail. If this is the case, politely ask the examiner if you can try the manoeuvre again. This really is up to the discretion of the examiner, but time permitting, they will hopefully let you try again. APPROACHING VEHICLES AND PEDESTRIANS:The best reverse parallel park in the world is still a fail if not effective and appropriate observations are completed. It really is essential that you keep the manoeuvre very slow so as to know where your reference points are and to look around in all directions at all times. If you feel you are a danger to anyone, stop the car and proceed when safe. PLENTY OF TIME: The examiner is not looking for you to demonstrate the manoeuvre in record time. They are looking for you to do it safely and accurately. You have around 4 minutes to do this. Use that time! It is much easier and safer to do it slowly than to rush things.